In 2009 our family was invited to a dinner party at one of our neighbors homes, little did we know that night would change our lives forever!! While we were at the dinner party we met the most amazing dog, an Austrailian Bulldog named Brutus. Our neighbors had moved to the USA from Australia and had brought Brutus with them. If it wasn't for our neighbors...we may never have had the privilege of even know such a remarkable breed existed!! an Australian Bulldog of our own!! Aussie to join our family. 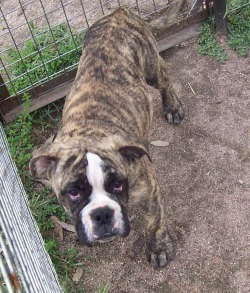 We searched and searched and then met an amazing breeder, Karinga Aussie Bulldogs via their website. We fell in love with their girl Karinga Pangari (AKA Roxy) and even though they had never shipped to the USA before, they were so brave and trusting to be willing to work with us to bring Roxy to her new home in America!! I can't imagine how they felt when it came time to put their baby on the plane, but were are eternally grateful that they did!! Roxy has turned our entire family into quite the Aussie Bulldog loving group!! They are truly a part of our family and we are so honored to be able to love them and provide them with love, fun, and family!! Our breeding program will be very family oriented...these are our babies and are members of our family. We have 3 children who will be just as much a part of this wonderful experience as we are. We will be breeding for quality not quantity and will be striving to breed the best Aussie Bulldogs possible according to the guidelines set forth by The Austalian Bulldog Association (ABA). Our dogs will only be going to homes that have been very carefully pre-screened to ensure that these amazing animals are given the most perfect, wonderful lives that they deserve.